Edouard Chautard and Carine Thomas have completed another adventure! After long and careful preparations, and a good deal of advice from Australian Long Riders Sharon and Ken Roberts, our two Caledonian Long Riders have now ridden along Australia's Bicentennial National Trail! Edouard and Carine are the first people to have made a Long Ride in Edouard's native New Caledonia (click here for information about their previous adventure). Click on photograph of Sharon, Ken, Edouard and Carine to enlarge. Edouard and Carine have met up with famous Australian Long Riders, Ken and Sharon Roberts! Ken and Sharon, the first people ever to ride the whole length of the BNT, gave the intrepid New Caledonian pair a tremendous amount of help and support before they even started their journey. This photograph shows the four of them sitting happily around the camp fire. The Long Riders' Guild has just received an email from Edouard, giving us a resume of their trip so far. 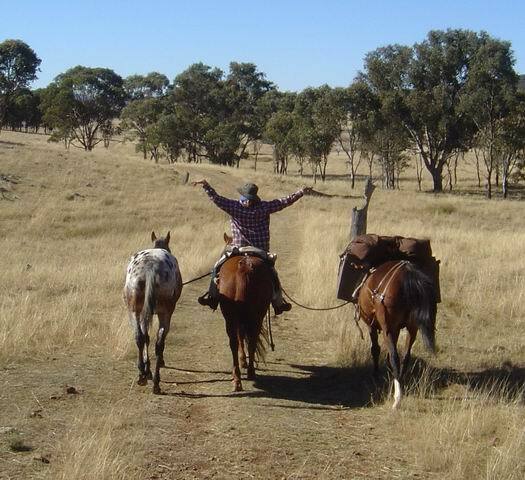 "We bought our 5 horses at Echuca, in a horse sale. We did the best we could, but as we couldn’t try the horses before buying them, we had big surprises the first time we hopped on. They were jumping all around. As we went through Victoria, my riding mare got injured in a fence during a rest day in a small village. Carine's horse was also very sad on the trip, and was losing too much condition. A third horse was recovering from a sore wither. 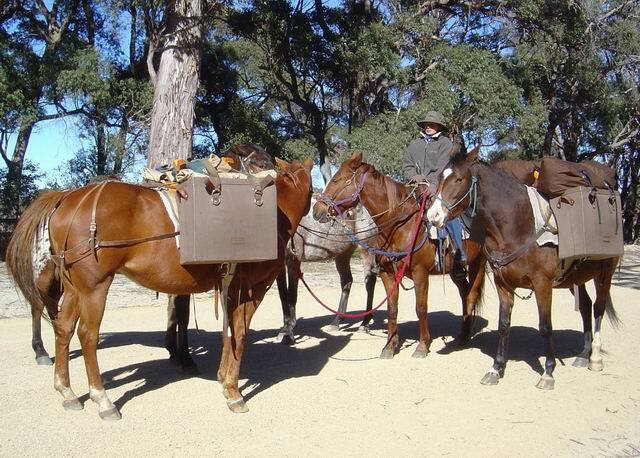 So we had only two pack horses, and nothing else to ride. As we were not far away from Long Riders Sharon & Ken Roberts, I rang them for advice. Ken told me : "Leave this town, keep on moving, you're only a week’s ride from us, we'll help you then to find a new horse." So we did. They helped us to find a new horse, and we've let Carine's riding horse to a girl. The horse we got was not well broken under the saddle. So Sharon & Ken helped us at the beginning, and they came on the trail with us the first day to help us. We then went through Canberra, where there was a very bad drought. No grass, no water in rivers, and even in dams. Sometimes, we could smell dead sheep in the only water we had for the night. But we managed to go through all that, and got to New England, one of the coldest places in Australia, right in the middle of winter. Minus 15o Celsius [4o Fahrenheit] every night for two months. By the end of June, we got to the Queensland border, which was our most important goal. The weather is better now, but we are again in a severe drought. All the grass is burnt by the frosts they have had. Moving north is a bit difficult now. Anyhow, we are on the last leg of our trip. We might stop soon, but we don't know where exactly. The 5 horses are in very good condition, and so are we. We made friends with some people we met on our way. They said they will look after our horses after we finish our trip. So, when we decide to stop, we'll truck them down to their place to give them a good retirement. 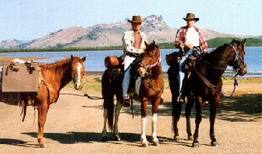 "We gave two of our horses (Dakota and Rose) to friends we met along the way, Hazel and Martin, and we decided to try to ship the others to New Caledonia. After four months of work we have managed to get all the necessary documents. 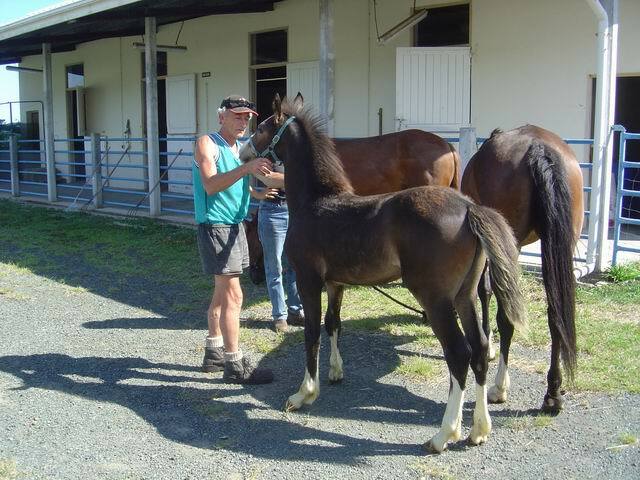 We hope that any day now Shadow (Carine's saddle horse), Hopi (my saddle horse, bought with Sharon and Ken's help at Khankoban) and Road Trip, plus her foal will arrive here. Our Long Ride will really only end when they get here, and we will then turn the page." 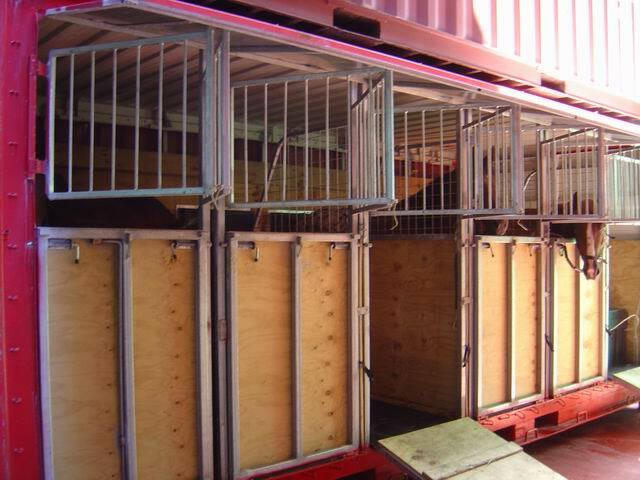 The horses have now arrived! 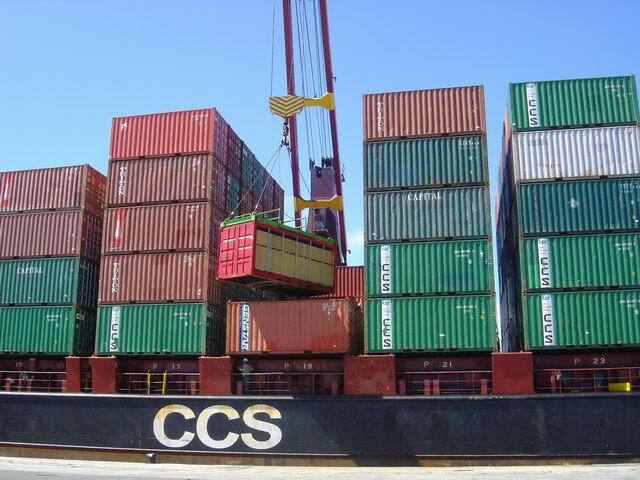 See pictures below to see how they were transported to New Caledonia. As Edouard put it, "The foal is only 4 months old, but already really big ! Maybe he is half Clydesdale !" 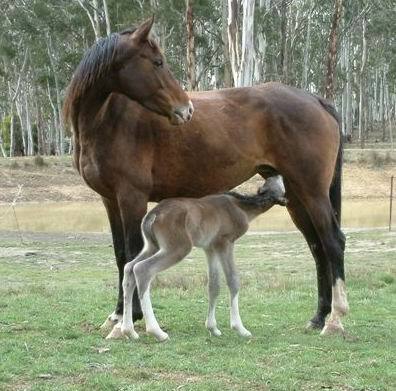 Here is the giant foal! For up-to-date information about Edouard and Carine's ride, please click here: http://www.ifrance.com/carine-et-edouard - and click on the Australian flag in the top right corner for the English-language version.